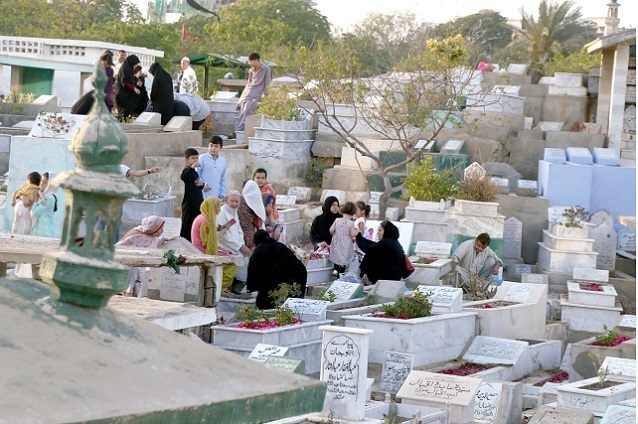 Muslim­s believ­e God shower­s infini­te mercy, blessi­ng upon human beings on this nightReligious festivities for Shab-e-Barat are being carried out throughout the country with traditional zeal and fervour. The faithful have organised several gatherings and Mehfil-e-Naat, where hymns are being recited. Though in Islamic perspective every night and day have its own significance, some nights have added importance such as Shab-e-Barat, Lailatul Qadar, Shab-e-Miraj, Ashura and the two nights of Eid. On Shab-e-Baraat, Muslims believe, God showers infinite mercy and blessing upon human beings. Hence, many pray for the length of the night. Monte Carlo: Rafael Nadal crashed out to Fabio Fognini in the Monte Carlo Masters semi-finals on Saturday with the Spanish star admitting his 6-4, 6-2 loss was his “worst clay court match in 14 years”. The shock result leaves Italian 13th seed Fognini facing unseeded Serb Dusan Lajovic in Sunday’s unscripted final. “I played one of my worst matches on clay in 14 years,” said Nadal. Nadal saved three match points while trailing a set and 5-0 as he broke Fognini in a last-gasp effort. “I’ve beaten Rafa on clay, I’m really happy, it was windy and tough to play. There is talk, as their often is, of bringing in a presidential system in the country. This particular iteration of the debate was launched off by Hamza Ali Abbasi, the PTI-supporting actor, on social media. As opposed to common belief, the prime minister in a parliamentary system is actually more powerful than the president in a presidential system. The prime minister – and, by extensions, fanboys like Hamza Abbasi – seems to think Asad Umer did not perform well. What did you make of the little bit of spoils system power that you did have? ISLAMABAD: Former interior minister Chaudhry Nisar Ali Khan is likely to meet President Pakistan Muslim League-Nawaz (PML-N) Mian Shehbaz Sharif in London. According to media reports, Chaudhry Nisar decided to make contacts with PML-N after the rejection of latter narrative of resistant politics. In this regard, his first meeting with the PML-N President is likely to take place in London. Chaudhry Nisar is likely to take oath as a member of the provincial assembly after April 24. However, he succeeded on provincial assembly seat and he has not taken oath so far. Despite the offensive, Haftar’s Libya National Army (LNA) force has not been able to breach the southern defenses of forces allied to the internationally recognized administration based in the city. Both sides claimed progress in southern Tripoli, but no more details were immediately available. A Reuters TV cameraman visiting the southern Khalat Furgan suburb heard heavy shelling but saw no apparent major change in the frontline. On Friday, two children were killed in shelling in southern Tripoli, residents said. In western Libya polls in several communities had been postponed a week ago due to the fighting. ISLAMABAD: Parliamentarians hold immense responsibility to take corrective legislative steps towards water conservation and must vigorously engage with executives on building inclusive frameworks for reduction of climate change impacts. While addressing the Working Group on Water Crisis, Senator Pervaiz Rasheed said water crisis was the most critical issue that could endanger our survival on this planet as it was the premium ingredient to sustaining life on earth. “As parliamentarians, we hold immense responsibility to take corrective legislative steps towards water conservation and to ensure that no human being was deprived of this basic right. Parliamentarians must vigorously engage with executives on building inclusive frameworks for reduction of climate change impacts,” Pervaiz Rasheed maintained. 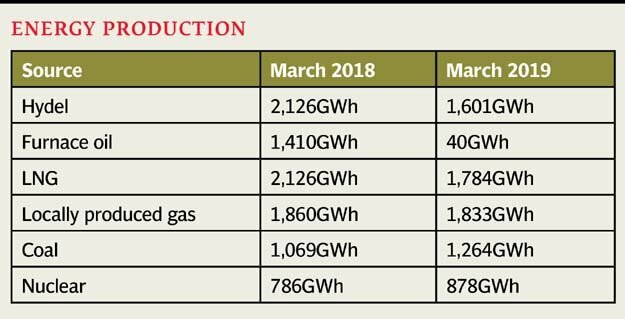 It addresses almost all relevant issues concerning the management of water resources including the looming threat of climate change, he added. 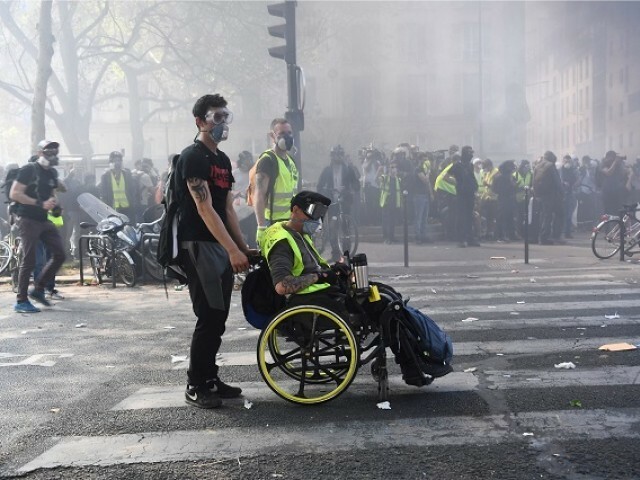 PARIS: Clashes broke out between dozens of demonstrators and police in Paris on the 23rd Saturday of yellow-vest protests after authorities warned that rioters could return to the French capital to spark a new wave of violence. Some officers also marched toward demonstrators to control the crowd and funnel it to Paris’ Place de la Republique, where most of the demonstrators were contained in the late afternoon. As of 1200 GMT, a total of 9,600 people were demonstrating across France, including 6,700 in Paris, the interior ministry said. As of 1300 GMT, 110 people had been arrested and placed in custody, the Paris prosecutor’s office said. Large portions of the Paris metro network were closed and about 60,000 police were deployed across France, authorities said. KARACHI: Pakistan People’s Party (PPP) Chairman Bilawal Bhutto-Zardari once again hit out at Pakistan Tehreek-e-Insaf (PTI) government for appointing ministers that “aid and abet terrorist groups” in the country. The PPP chairman said that questions will be asked to the government if the ministers are known for their contact with the terror outfits. We want the system keep going but if such people are given positions then there will be questions asked,” said Bilawal. Bilawal has been criticising the PTI minister for quite a while now, prompting a strong reaction from the government quarters. Those who have supported such groups and their training camps must be removed from the federal cabinet,” he had said. Militants have killed more than 60 Syrian regime fighters in 48 hours, a monitor said on Saturday, in some of the deadliest attacks on pro-Damascus forces in recent weeks. Since Thursday, IS militants have killed 35 pro-Damascus fighters in regime-held parts of central and eastern Syria, the Syrian Observatory for Human Rights said. Regime fighters also came under attack on another front of Syria’s grinding eight-year war, the Britain-based monitor added. On Saturday, militants linked to Syria’s former Al-Qaeda affiliate attacked loyalists outside the northwestern region of Idlib, killing 26 pro-Assad fighters, it said. The Observatory also said IS fighters killed another eight soldiers and militiamen in the eastern province of Deir Ezzor on Thursday night. Journa­lists report­ed scuffl­es betwee­n police and protes­ters in the aftern­oonPARIS: French police said they arrested more than 100 “yellow vest” demonstrators in Paris on Saturday as clashes broke out with protestors taking to the streets for a 23rd week of anti-government marches. Police headquarters reported 126 arrests and 11,000 checks on individual protesters. Paris seemed to bear the brunt of the protests but demonstrations also took place in other French cities, including Bordeaux and Toulouse. The “yellow vest” movement is demanding changes to the government’s social and fiscal policies. Interior ministry figures put the number of demonstrators nationwide at 9,600 at 2 pm (1200 GMT), including 6,700 in the capital. Pupils attend­ing Intern­ationa­l Baccal­aureat­e school­s will be taught the new course ‘Digita­l Societ­y’Students in the United Arab Emirates will soon start learning about ‘fake news’ as part of a new requirement in their curriculum. Pupils attending International Baccalaureate schools, according to a Khaleej Times report, will be educated on how to identify genuine and false news stories, along with the impact fake news can have on a person’s life. 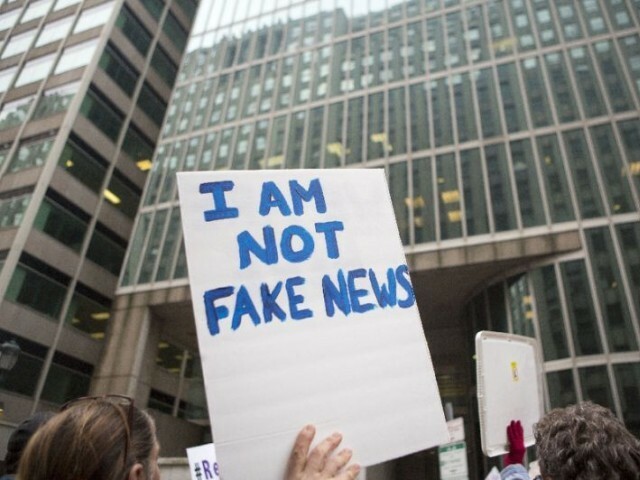 The term “fake news” went mainstream during the 2016 US presidential campaign when hundreds of websites and social media accounts published false or biased stories. Social media a popular, yet not trusted, news source: surveyThe new subjects are applicable to thousands of pupils enrolled in the International Baccalaureate Diploma Programme and career-related programmes across UAE schools. It will teach students the importance of ethical, social and cultural understanding of technology and media. BAGHDAD: Iraq hosted senior parliamentary officials from arch-rivals Saudi Arabia and Iran on Saturday as Prime Minister Adel Abdul Mahdi sought to bolster his country’s nascent role as a mediator in the region. Abdul Mahdi recently returned from visits to Iran and Saudi Arabia, both oil-super-powers that have long been vying for dominance in the Middle East. The Iraqi premier has said Iraq will maintain strong ties with Iran, but also with Washington and regional neighbours, many of which, like Saudi Arabia, consider Tehran a foe. Iraq and Saudi Arabia have been at loggerheads since the Iraqi invasion of Kuwait in 1990, but they have recently undertaken a diplomatic push to improve ties. Many of Iraq’s leaders, from its Shi’ite majority, have close ties with Iran, the main Shi’ite power in the Middle East. 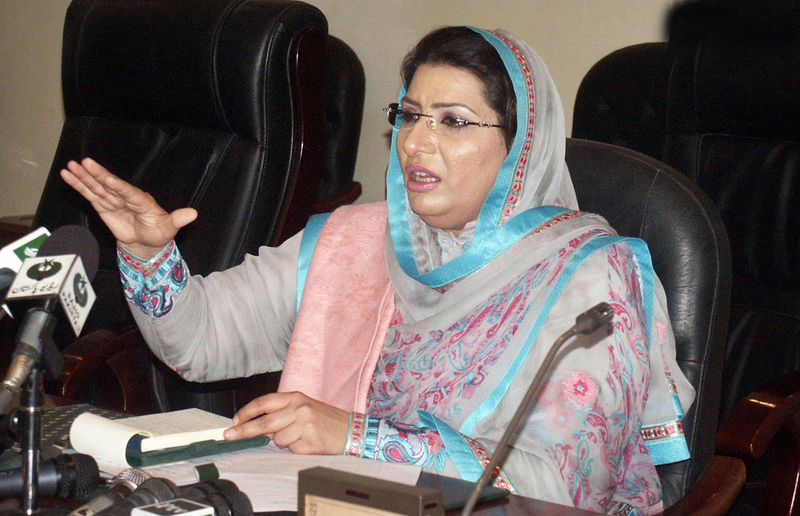 –PM’s special assistant says defeating inflation govt’s top priorityISLAMABAD: Prime Minister Imran Khan will pay a visit to the Hazara families on Sunday and offer his condolences over last week’s Hazarganji suicide bombing that had left at least 18 people dead. 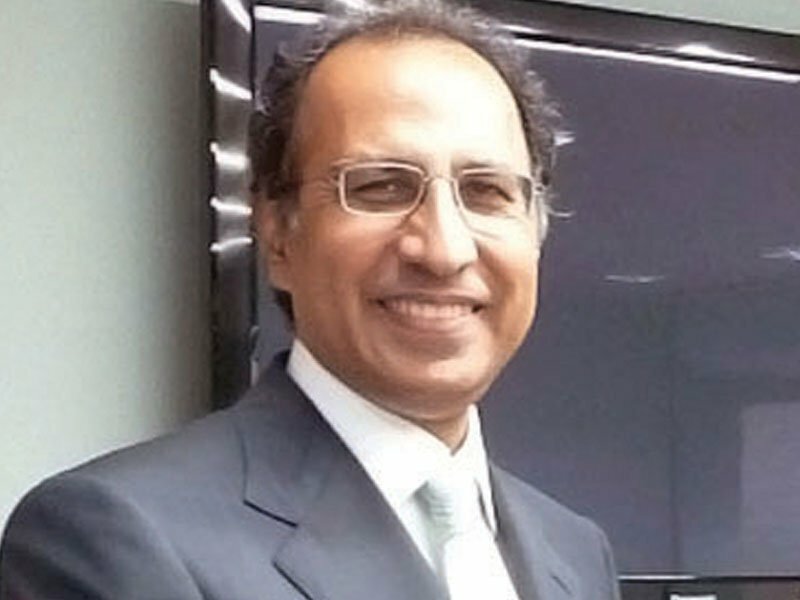 Awan said that the prime minister has assigned targets and responsibilities to the new economic team led by Adviser on Finance Abdul Hafeez Shaikh. To a question whether who will visit Asad Umar to persuade him, “We persuade those who are angry, and there is no such case in this situation,” she responded. To a question, Dr Firdous Ashiq said Asad Umar was an important players of the prime minister’s team and he would be soon in action to defend his vision. The special assistant to the PM said she believed in the teamwork and would take along all the stakeholders to run the affairs of her portfolio. ISLAMABAD: Ministry of Foreign Affairs on Saturday said that they were closely following the evolving situation in Libya. Ministry of Foreign Affairs was in constant contact with their Mission in Tripoli with regard to the safety and security of Pakistani nationals, said a news release issued here. The Ambassador was in liaison with the community members and other concerned to address any contingencies. All Pakistanis, living in the country and abroad, were advised to postpone travel to Libya. All concerned have been advised to contact the Crisis Management Cell at the Ministry of Foreign Affairs in Islamabad and the Pakistan Mission in Tripoli for any assistance and information. 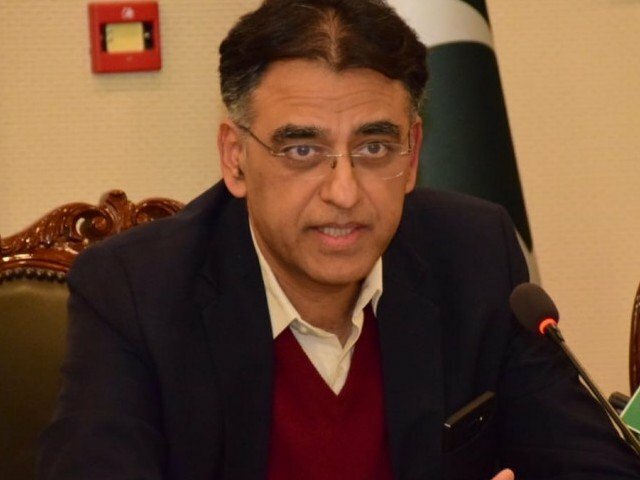 'It's your passio­n from which Imran Khan and his team draw energy'Former finance minister Asad Umar has thanked all those who expressed their support since his removal from the cabinet post two days ago. “[I] want to thank the many many people who expressed support over the last two days,” the Pakistan Tehreek-e-Insaf leader tweeted on Saturday. Umar said it was Prime Minister Imran Khan’s passion the entire teams drew energy from. want to thank the many many people who expressed support over the last 2 days. May Allah bless you all — Asad Umar (@Asad_Umar) April 20, 2019The former corporate bigwig was removed as the finance minister by PM Imran on April 18 as a part of a major reshuffle in the federal cabinet.